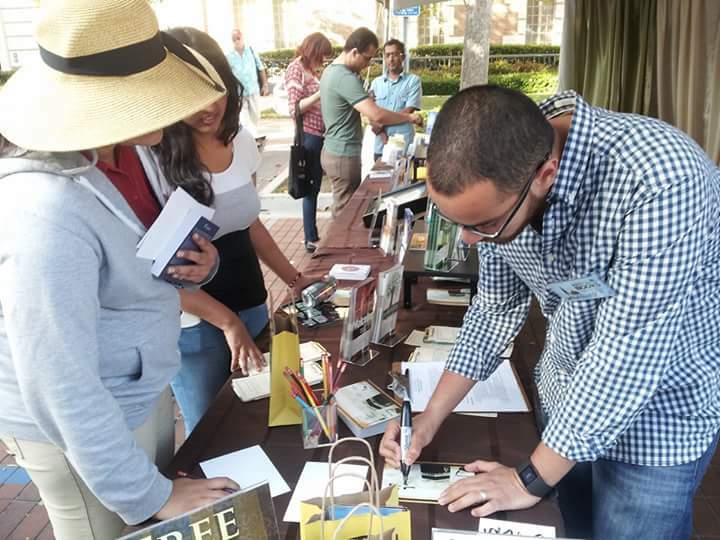 This was the 10th year that ICNA’s WhyIslam project presented itself with the largest booth on the USC campus. Over 20 certified volunteers spent their weekend reaching out to Muslims and Non-Muslims alike carrying the Message of Islam to those eager to learn about Islam. The outreach was very successful, evidenced by the huge crowd of interested people. 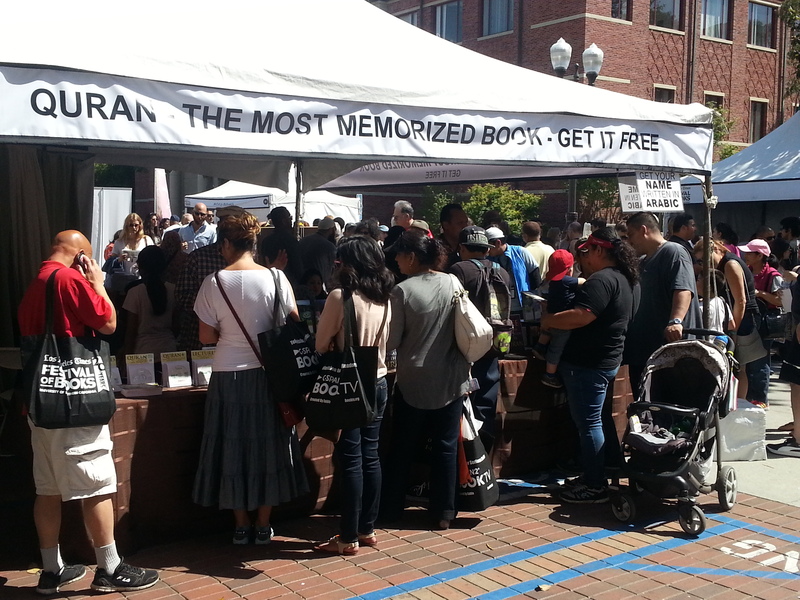 At times the line for the booth caused issues with traffic flow at the book festival. We had an early visitor to the booth who was a Catholic Priest. He was given the clear message that Islam was not a new faith delivered by Muhammad (PBUH), but was the same message that was brought to mankind by previous prophets like Abraham, Moses and Jesus. Visitors to the WhyIslam booth came from all walks of life with varying religious and social backgrounds. Including, but not limited to Catholics, Christians of different denominations, Jews, Atheists, Agnostics, Buddhists, and Hindus. Everyone was offered free translations of the Quran. Other bonus material given included brochures, CDs and DVDs containing information about Islam and subjects of interests. A young non-practicing Muslim Sister questioned the necessity of praying five time times a day and fasting. Using wisdom and good words, a certified volunteer explained the rulings and advised her to do more research and re-orient herself with the faith.Another middle-aged gentleman approached the booth with his misunderstanding of Islam based on acts committed by extremists in the name of Islam. He was shown the verses in Quran regarding the sanctity of life and was explained that acts of some deviant people do not represent Islam. He left with a positive understanding of Islam and thanked Muslims for making it clear to him.Most people were surprised to find out that Abraham, Jesus, Moses and other Prophets mentioned in Bible were also mentioned in Quran. Visitors were amazed to see many scientific and historical miracles in the Quran. 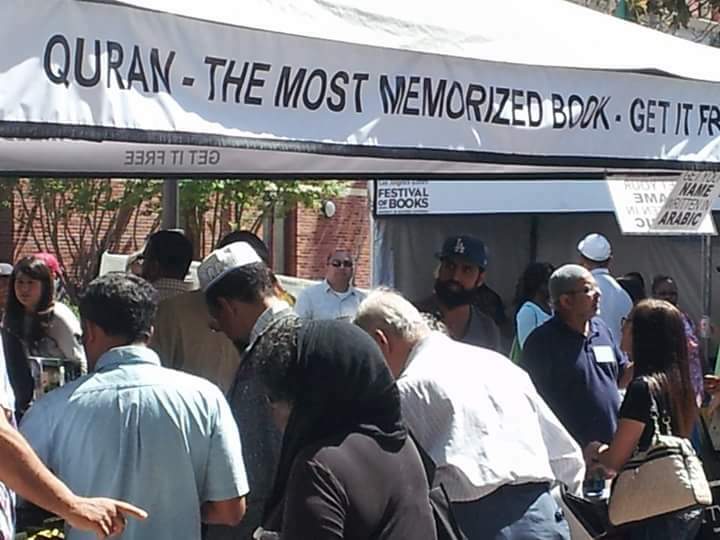 During this two-day event close to 3,000 copies of Quran, about 6,000 brochures and over 600 CD/DVDs were distributed to visitors at the booth. Guests were raving about getting their names written in Arabic and getting free Henna designs. These services gave WhyIslam volunteers additional opportunities to talk to people at length. A quiz was also offered to test visitor’s knowledge of Islam and was well received.A number of people accepted Islam as their new faith, once they understood the true message of Islam. Everyone who approached our booth and talked to a Da’eeh, left with a better understanding of Islam. At times the booth got busy and there were not enough volunteers to give the deserved time to each guest. Conversations had to be cut short due to the influx of people who were waiting to ask questions. A number of Muslims like yourself, also approached the booth and gave words of encouragements to the volunteers. 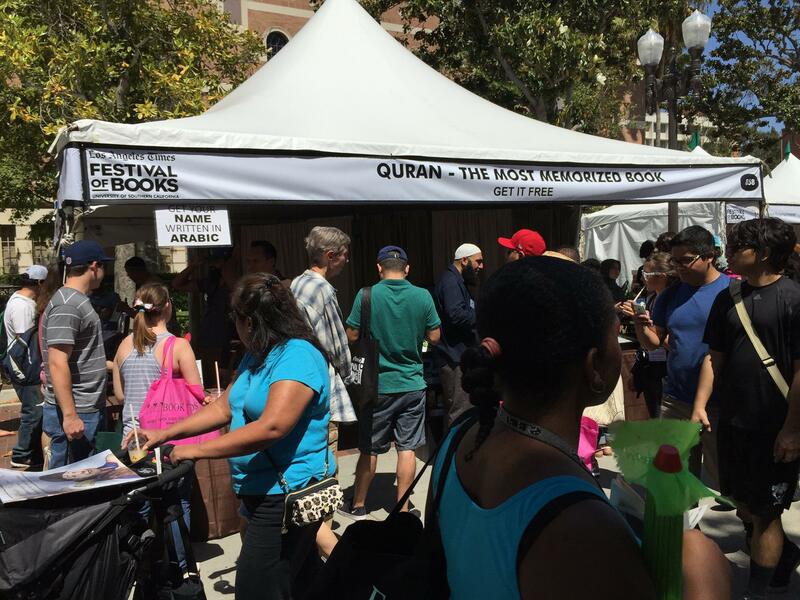 The WhyIslam booth was a tremendous benefit to the book festival attendees, as well as to the Muslim community by helping to clarify misconceptions of the general population. The volunteers were able to convey the message of Islam. Certified volunteers helped counter much negativity that is present in the media by talking to 1 person at a time. May Allah accept everyone’s efforts and lift the veils from people’s eyes to see the true nature of Islam.